In a previous post, we talked about different applications for fire-resistant (FR) clothing. 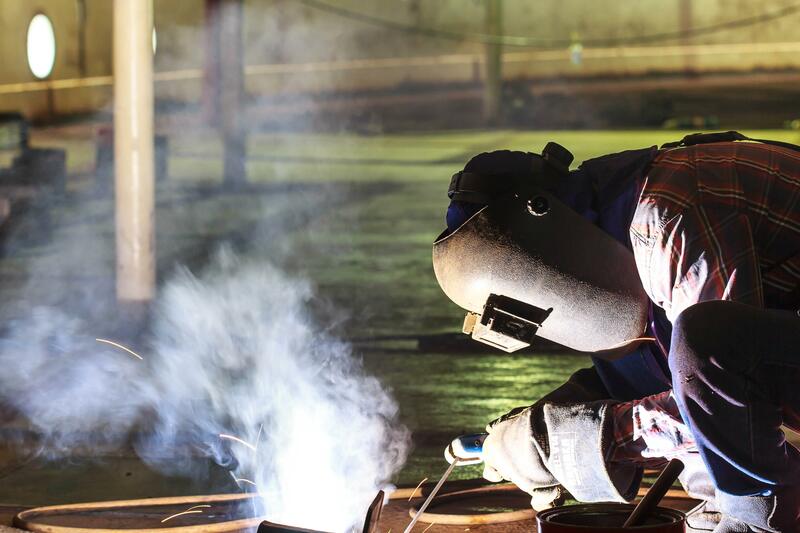 Work environments that have a risk of explosions, radiant heat or hazards such as liquid, chemicals, dust or particulates are the most common situations that require a particular form of FR protective wear. Now that we have an understanding of those situations and which measures we should take to protect workers, let’s take a deeper look at the different levels of protection that FR Clothing offers. Arc flash is common when working around electric, for instance, working with electrical panels or industrial situations. An arc flash is when an electric current leaves its path and travels through the air from one conductor to another causing an explosion. This can happen due to dust, corrosion, accidental crossing of wires, condensation, faulty installation, or any number of things. The NFPA70E standard covers certain aspects of electrical safety and recommended FR clothing. Flash fire is a sudden and intense fire that is caused when a mixture of air and a flammable substance combined to ignite. Flash fires have extremely high heat, a short duration and a rapidly moving flame. These are often cataclysmic, causing extreme damage, injury and potential loss of life. The NFPA2112 standard specifies the minimum requirements of design, certification, testing and performance of flame resistant fabrics used for garments in those areas that are at risk of flash fires. When you’re choosing FR clothing you need to understand the level of protection it offers, as well as the longevity and durability of that protection. Has the garment been tested and evaluated by an independent laboratory? You’ll want to know whether its effectiveness has been proven. The next question to ask yourself is how you’re going to clean those FR garments: do you have a laundering system in place? The first step in choosing the right PPE for the job is identifying the hazard, whether it’s flash fire or electric arc flash. The next step would be to review the relevant standard, ASTM F1506 (NFPA 70E) or ASTM F1930 (NFPA 2112), for the specific garment and fabric performance specifications. 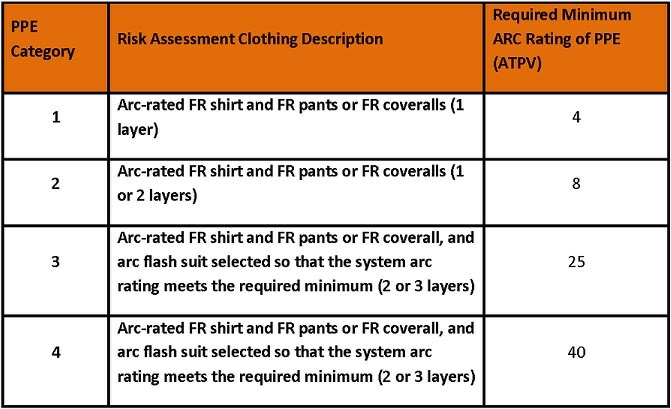 FR garments have a rating system based on the level of protection they offer. The Arc Thermal Performance Value (ATPV) is measured in calories (heat energy) per square inch of fabric. Basically this is the amount of energy which, if it passes through a fabric, has a 50% likelihood of causing 2nd or 3rd degree burns. The best fabric self-extinguishes quickly (the longer a fabric can burn, the more likely it is to get to your skin). The higher the rating, the more heat the garment can withstand before catching fire. Eclipse™ Jackets: Flame-resistant jacket is made of 10.5 oz. PVC on nonwoven Nomex® with Thermo-Grid™ technology. Thermo-O-Rad sealed seams offer waterproof protection. ANSI/ISEA 107, ASTM F1891, NFPA 70E CAT2, and ASTM F2733 compliant. HRC4 Arc Protection Kit, 43- Cal: Kit meets NFPA 70E/ASTM F 1506. Includes 35" Jacket and bib overalls, hood with hard cap, Class 2 rubber gloves, leather protectors, glove & gear bag, and safety glasses and ear plugs. Arc-Rated Knit Balaclava Hoods: Durable, lightweight and comfortable single layer top knit hood. NFPA 2112 is a pass/fail compliance based standard but it doesn’t actually tell you just how to achieve the highest level of protection possible. NFPA 2112 basically states that when tested, if there is evidence that body burn is less than 50% of the total body; it passes. The thing about 50% body burns is that the victim isn’t likely to survive. What the standard doesn’t tell you is that there are options that can provide even greater coverage and protection, potentially saving someone’s life or at minimum, reducing the impact of the burn. The right thing to do is choose the highest level of protection available when workers are in situations that have known fire risks. Making sure workers get home to their families every night should always be the number one concern. When we talk about potential cataclysmic events in the workplace and the impact of protective gear on a worker’s life, going above and beyond should be the standard. Knowing what risks and hazards exist in any environment is the first step to ensuring the safety of workers. Once we can identify the problems, we can then work towards solutions. Since personal protective equipment is the last line of defense a worker has against injury or even death, shouldn’t they be provided with equipment that has the highest level of protection?